Real gross domestic product is growing at an anemic pace. Exports are down, and state and local governments are spending less. The consumer price index is falling in a condition known as deflation. Even national defense spending is down. Despite the bad news, consumer spending and home building are rising. Real disposable personal income is roaring ahead at growth rates of 6.2 percent in the first quarter of 2015 and 3.6 percent at the end of 2014. Even the personal savings rate is up (5.5 percent so far this year and 6.2 percent at the end of 2014). These consumer factors are attributed to an increase in government social benefits, though, and not to jobs and economic prosperity. Social Security makes payments to more than 64 million Americans and nearly 3 million more receive federal government retirement checks. More than 20 percent of the US population is basically living on fixed-incomes. The banks also continue to benefit from government largess. The Federal Reserve’s Open Market Committee has been holding onto the view “that the current 0 to 1/4 percent target range for the federal funds rate remains appropriate” for more than five years. The stated purpose of offering this free money to banks is to maintain high employment. Although the Fed declines to set a specific goal, they generally believe that the unemployment rate should be around “5.2 percent to 6.0 percent.” For perspective, the US unemployment rate averaged 6.15 percent last year (2014); compare that to an average unemployment rate of 4.62 percent in 2007, the year before the financial crisis that was the reason for dropping the federal funds rate to zero. The offsetting condition that could thwart the Fed’s efforts to bolster the economy is high inflation – too much money chasing too few goods. The Fed has a stated goal of keeping inflation at or below 2%. As long as there are enough people working, producing plenty of goods and having money to spend on those goods, inflation this should not be a problem. In the 12 months just ended, consumer prices fell 0.1 percent. In 2007, prices rose about 2.1 percent. The most recent peak inflation was nearly 6 percent in 2008 and the peak deflation was about -2.4 percent in 2009. As long as there is some unemployment, wages and prices will not rise too rapidly – if we had more jobs than workers there would be a tendency for employers to bid up wages in trying to attract the best workers. But we are facing the opposite situation. Despite so much Federal Reserve money pouring into banks, the economy is slowing and deflating. There is worse news. Corporate fixed investment is running higher than the cash being generated by businesses. This was true in 2007 right before the crash and also in 1977 when Hyman Minsky wrote about “the era of the post-World War II financial crunches, squeezes, and debacles.” Corporations investing more than they are earning is the kind of event the Fed means when they write: “The Committee currently anticipates that, even after employment and inflation are near mandate-consistent levels, economic conditions may, for some time, warrant” continuing their loose money policy. They are referring to exactly this condition where an incipient financial crisis can be triggered by increases in interest rates. The reasoning is quite simple: if businesses are investing more than they are making, they must be borrowing to do it. Fixed investment – the construction of things like buildings, plants and factories – has to be paid for before it produces income. That means taking a lot of short term loans, refinancing them when they come due and sometimes borrowing a little more to cover the interest due on the last loan. If interest rates rise between the planning phase and when the completed project starts generating revenue, that is what triggers Minsky’s “incipient” financial crisis. The only difference between the gap in 2007 and the gap in 2014 is that some of it is being made up by foreign earnings – a source that may not hold up as Europe teeters on its third recession in six years, China’s growth slows and Japan continues to struggle. The possibility of the Fed raising interest rates is receding further and further into the future. Falling prices and low interest rates might sound like “good” things. They are not. Low interest rates favor borrowers (and speculators) but it harms the elderly and baby-boomers going onto pensions because it reduces the rate of return they can earn on their safe-harbor investments like savings accounts and government bonds. Speculators in stocks, real estate, collectibles, etc. make out in a low-interest rate environment with deflation. Safe-and-sound investors are more likely to lose because they are more likely to depend on interest for income. This is especially true for households living on fixed incomes and have a low tolerance for investment risk. This is another Lesson Not Learned by US policymakers: Banks and businesses find a way around Fed policy while consumers take it on the chin. We will all be better off when businesses depart from the crony-capitalist cycle of dependency on Federal Reserve hand outs. The business and consumer winners in the post-Capitalist society will be the ones who learn to accumulate human-capital knowledge instead of staking the health of the economy on financial capital. Capital flows are characterized by panics and manias. It will take human knowledge to resolve the financial crises that follow. 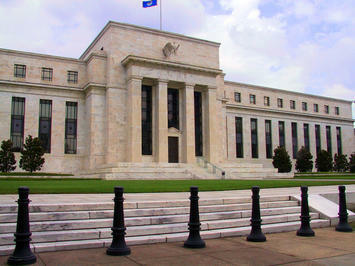 Photo: "Federal Reserve" by Dan Smith - Own work. Licensed under CC BY-SA 2.5 via Wikimedia Commons.